What a terrible story about the romance between the two teenagers in Afghanistan. This is a slam-dunk for political asylum. In France, above all. If BHL leads the campaign, I’ll support him on it. Hussein Ibish, whose analyses I invariably find myself in complete agreement with, has a post on his blog defending Jeffrey Goldberg, whose analyses I often—though do not always—agree with. Ibish observes, among other things, that Goldberg is the subject of vitriolic hatred from both right-wing Zionists and the Palestinian amen corner. Likewise with Ibish himself. I’ve heard attacks on the two from friends whom I respect and have never understand them. They strike me as visceral and not entirely rational. (In Goldberg’s case, I suppose that if I had read him during the Iraq invasion, which he supported, that he would be on my sh*t list, but I didn’t know him back then, so don’t care). In any case, all I can say is that if someone gets it from both aforementioned camps on the toxic Israeli-Palestinian issue, he or she must be doing something right. Last week I posted a piece (via Paul Krugman’s blog) by Bruce Bartlett—a moderate Republican—on President Obama’s negotiating style, which Bartlett correctly sees as being weak. Bartlett contrasted Obama with presidents who had to deal with the American labor movement in its heyday, which was a redoubtable force at the negotiating table. À propos—and as I have learned—, the recent agreement ending the National Football League labor dispute turned out to be a big victory for the NFL players union. I didn’t follow the details of it that closely but I don’t think this is how it was reported in the mainstream media. But as Dave Zirin, sports correspondent of The Nation—and who thus knows of what he speaks—tells us here, the NFL players won a “remarkable victory.” Cool. Okay, NFL players, with their seven figure salaries, may not exactly be les damnés de la terre. Then again, with the brain and other traumas they suffer after their careers are over, maybe they are. 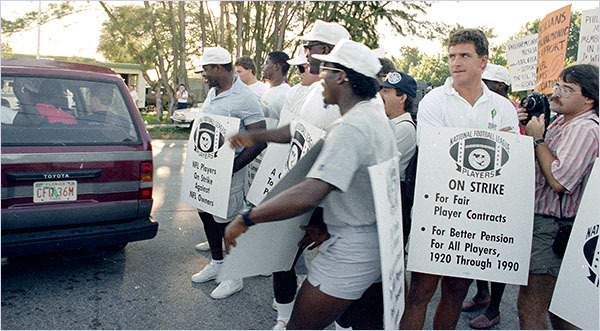 This piece from TNR discusses the labor agreement in the context of the players’ health issues (à propos, I remember Dave Duerson from the great Chicago Bears team of the mid-80s). On the subject of labor unions, a week ago my wife and I watched the 1979 movie ‘Norma Rae‘, which I had a seen a couple of times but way back then. It’s held up as a film, though does indeed depict a bygone era. An era before Barack Obama came of age politically. As for the title of this post, listen here. Yes, what IS he thinking? Boehner hadn’t realized at first that he’d have so many Republican defectors—fifty-four—who voted against the continuing resolution he’d negotiated with Obama in early April, on the ground that it didn’t cut spending enough, though Boehner had, in effect, taken Obama to the cleaners. This established in both Democrats’ and Republicans’ minds the thought that Obama was a weak negotiator—a “pushover.” He was more widely seen among Democrats and other close observers as having a strategy of starting near where he thinks the Republicans are—at the fifty-yard line—and then moving closer to their position. The question arises, aside from Obama’s chronically allowing the Republicans to define the agenda and even the terminology (the pejorative word “Obamacare” is now even used by news broadcasters), why did he so definitively place himself on the side of the deficit reducers at a time when growth and job creation were by far the country’s most urgent needs? That explains a lot about the course the President has been taking this year. The political team’s reading of these voters was that to them, a dollar spent by government to create a job is a dollar wasted. The only thing that carries weight with such swing voters, they decided—in another arguable proposition—is cutting spending. Moreover, like Democrats—and very unlike Republicans—these voters do not consider “compromise” a dirty word. This is just such bullcrap. In regard to the 2010 midterms and the supposed “shellacking,” there are only two sets of numbers that are of real interest. The first is the total number of votes the candidates received in the 2008 presidential election. Obama got 69.5 million, McCain a shade under 60 million. No one would have ever predicted such a number for a Democratic candidate (which was 10 million more than John Kerry in ’04). Obama’s margin of victory was due, of course, to an exceptional mobilization of the Democratic base—actual and potential—, and particularly black voters, who, for the first time in American history, voted in proportionally equal numbers to white voters. The second set of numbers is the vote totals in the 2010 midterms: 44.5 million for Republican candidates, 38.9 million for Democrats. The “shellacking” the GOP administered to Obama occurred with it receiving 15 million fewer votes than its presidential candidate two years earlier. What was noteworthy in 2010 was the exceptional demobilization of a demoralized Democratic base. Of course we know that there is always a falloff in midterm elections, but it was significant for the Dems in 2010, who received 3 million fewer votes than in the 2006 midterms (whereas the fired up Republicans improved on their ’06 figure by 9 million). 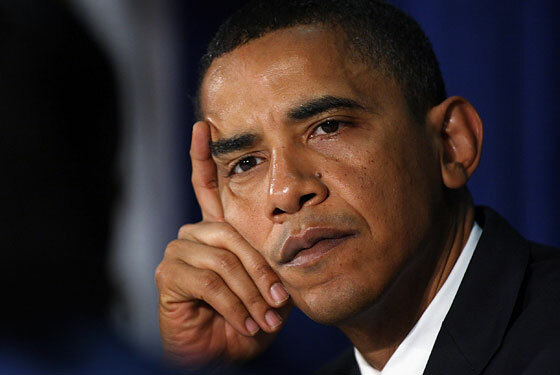 So how Obama and his political advisers could possibly think that the way to go politically was not only not to remobilize the Democratic base but to ignore it altogether is beyond me. Obama turns his back on his own party’s principles and then expects a docile party to do his bidding. House Democrats are now expected to provide something like a hundred votes to get this appalling deal approved. It would be far better for them to vote down the deal and force the president to turn to the 14th Amendment to honor the debt of the United States, which he should have done all along. Will the congressional Dems follow this wise advice? Dream on. This is hilarious. The follow-up too. Interesting perspective and worth reading. 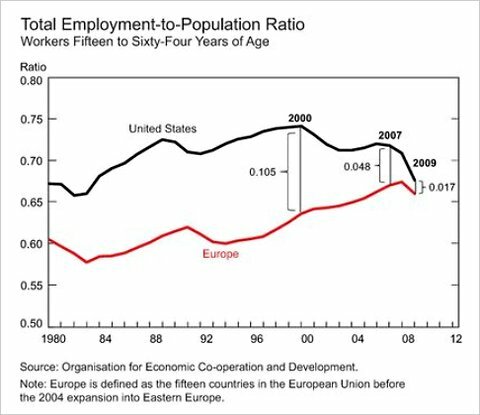 I just have to post this item from Paul Krugman’s blog, on the vanishing US-EU employment gap. I know that the workforce participation rate in the US has been dropping over the past decade but I’ve had it in my mind that it was still higher than the EU average. But it’s not. Amazing.